Do you run an app development business? It is important to stay on top of latest developments. This includes knowing how augmented reality works. People often think of the “real world” as separate from our mobile worlds. But apps that harness the power of augmented reality (AR) are blurring this line—allowing our mobile devices to interact meaningfully with our actual surroundings. One of the most well-known examples of an AR app is Niantic’s Pokémon Go, which took the world by storm upon its release in 2016. Using GPS, this app tracks players’ locations, while also harnessing smartphone cameras to integrate Pokémon with players’ real-world surroundings. The result? Pokémon Go enthusiasts can point their smartphones at a body of water to catch water types, a field to catch grass types, etc. The game comes to life with more than just an in-app map; it harnesses actual geography and location. AR in mobile apps today isn’t all for the sake of fun and games, although that’s one-way developers are employing it. There are myriad uses for this emerging technology that app developers and marketers are keen to harness. Virtual tools like a tape measure or level. Route building for fitness app workouts. Adding AR content to storytelling. Translating real-world signs or notes. Integrating holograms and real-world scenes for photographs. The list of use cases for AR apps goes on and on. Since it’s an emerging technology, we’ll undoubtedly see it get better in the near future. App marketing is also an industry harnessing AR to create more interactive, immersive experiences for mobile users in the hopes of boosting engagement. Programmatic ad buying through companies like Liftoff has already been helping marketers serve highly personalized ads to mobile users, boosting quality user acquisition and engagement rates. The next step forward could very well be programmatic AR-powered banner ads that are “contextually relevant” to the users interacting with them. In fact, some experts estimate that AR ad revenues will exceed $2 billion by the year 2022. One category of app in particular has been quick to put AR technology to use, and that’s ecommerce. One of the biggest challenges in ecommerce has been the fact that customers only get to see photographs and videos before buying something; online shopping doesn’t allow them to try on clothing or visualize a product in a real-world environment before they purchase. Well, AR is already helping retailers overcome that particular hurdle. Here’s just one cutting-edge example: Facebook and Nike have partnered to “let sneakerheads buy limited-editing pairs through the Messenger app…in AR.” The pinnacle of the experience is allowing potential buyers to look at a virtual version of the shoe, and move it around, before purchasing. Other brands are using AR within ecommerce apps to let customers “try out” products like furniture, home goods and makeup before committing to the purchase. The takeaway here is that AR is poised to bridge the gap between ecommerce merchants and remote customers. When you can’t try something on in real life, it seems the next best thing is doing so virtually. This can help buyers make purchasing decisions in favor of online sellers. We’re already seeing how augmented reality is altering the playing field for the mobile app user experience. It’s likely the future will bring an even more aggressive shift that pushes AR mobile app advertising and usage into the spotlight. Are You Ready to Capitalize off Augmented Reality? Augmented reality is changing the future of mobile apps. App developers should integrate it into their new products. 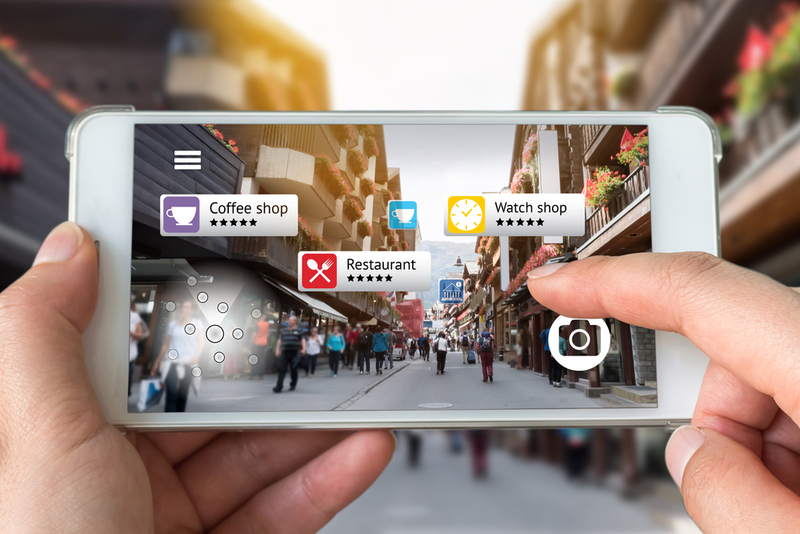 If you are smart about it, you can find ways to use augmented reality to improve the user experience for your customers.